The post Let’s Talk About Dogs and Muzzles by Annie Phenix, CPDT-KA appeared first on Dogster. Copying over entire articles infringes on copyright laws. You may not be aware of it, but all of these articles were assigned, contracted and paid for, so they aren’t considered public domain. However, we appreciate that you like the article and would love it if you continued sharing just the first paragraph of an article, then linking out to the rest of the piece on Dogster.com. I’ll never forget being at nearly 10,000 feet in elevation on a gorgeous Colorado hike with several other dog trainers when we rounded a curve and came across a responsible dog owner who had her dog not only on leash (although dogs were permitted to be off leash and “under voice control” in this area), but in a muzzle. We stopped in unison and loudly thanked the dog owner. And, we were truly thankful because she was taking a preventive action to protect her dog as well as potentially protecting other dogs or people from her own. Why do dogs need muzzles? A woman putting a basket muzzle on her dog. Photography ©MilanMarkovic | Getty Images. The dog loves to eat animal poop. The dog is in an area where poisonous plants or other harmful things to ingest are present. The dog has a medical issue that the owner needs to prevent the dog from biting or licking something on the dog’s body. The dog is going to the veterinarian’s office and that’s the one place that makes her nervous, so an ounce of prevention is in place. The dog has a history of nipping at/biting humans or other animals. The dog is a sport dog used to wearing muzzles in competition. The dog has general anxiety and has been trained to relax when wearing a muzzle. It’s time to put aside human judgments on this valuable tool. Having said that, it is vital to introduce a muzzle that won’t have your dog running at the sight of it. Never hold down your dog and just slap on a muzzle — you won’t get the positive results you are hoping for. Like many trainers, I believe it’s useful for all dogs to learn to be calm while wearing a muzzle. For one reason, if your dog is injured in his lifetime, he may very well be muzzled while receiving care at the vet’s office. Dogs in pain can bite — even your best friend who is currently looking at you all doe-eyed and who has no bite history. If your dog is injured and has been trained to accept a muzzle calmly, that helps keep your already stressed dog from adding yet another stressor when the muzzle is put on. There may also be a time in your dog’s life when a muzzle protects her from licking or gnawing on parts of her body that need to rest and heal. And, there are indeed cases where a dog has nipped at other dogs or people, and a secure muzzle adds safety for the dog, as well as others the dog encounters. What the muzzle cannot do, however, is “fix” a behavior issue, such as snapping at others. A muzzle is a preventive management tool, but it is not a cure-all. You might have heard the expression “Management always fails,” and we say that because management can be fraught with human errors, such as neglecting to properly latch a muzzle, close a gate, shut a door, etc. Also, equipment can break or become worn out. 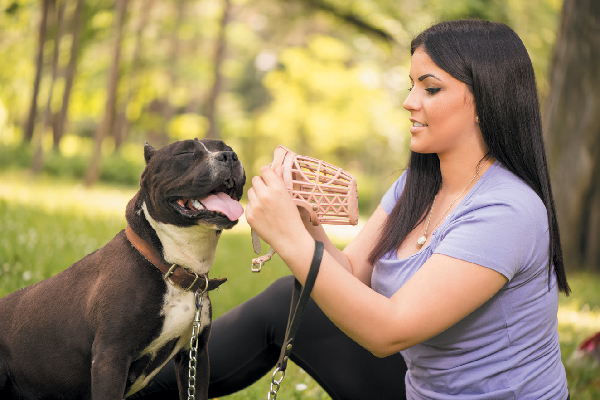 If you are going to use a muzzle, you need to know how to properly introduce your dog to it. I go very slowly and move at the dog’s comfort level. I start with the muzzle on the ground and allow the unleashed dog (working in a secure environment like a room in your home) to approach and sniff the muzzle that is filled with dog-satisfying, novel treats. I allow the dog to sniff and nudge the muzzle and get the treats out. From there I move to putting the muzzle near the dog’s nose and praise and treat if she doesn’t move away. I very slowly work up to having the dog put her snout inside of the muzzle. I put peanut butter or cream cheese inside the muzzle and hold it to the dog’s nose to let her lick all the good stuff out of the muzzle. When the dog is totally comfortable with inserting her nose into the muzzle, then — and only then — do I very briefly hook the muzzle’s latch behind the dog’s ears. I leave it on very briefly, then remove it. Then I put it on and off several times over the next few days, leaving it on a few minutes longer each time. I never force a dog who is uncomfortable in a muzzle to wear one. If a dog becomes uncomfortable while I’m training him to accept a muzzle, I back up to the place where the dog was OK with it and increase my reinforcement while I slow down my pace in terms of latching it onto the dog. The type of muzzle you use is crucial. I only use basket muzzles. I want the dog to be able to drink water, to breathe freely, to take training treats I give to him and, of course, I don’t want the dog to be able to bite. Tell us: Does your dog wear a muzzle / has he ever had to wear a muzzle? For more information on muzzle training and resources, check out The Muzzle Up Project at muzzleupproject.com. Thumbnail: Photography ©JohnGollop | Getty Images.